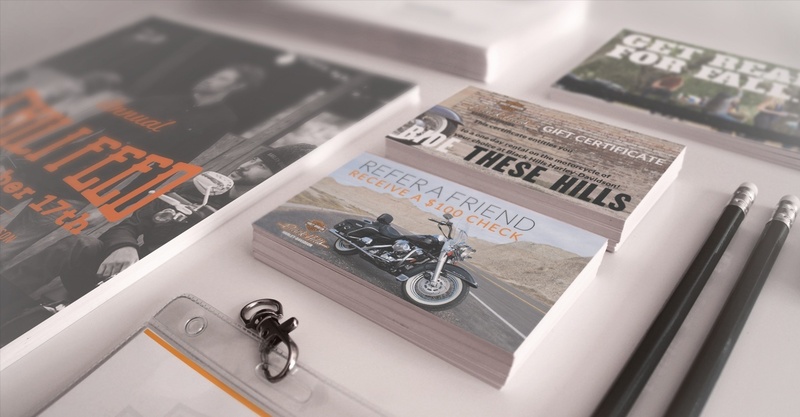 Black Hills Harley-Davidson came to us in early 2011 looking for a streamlined marketing process. After three years wtih a different marketing firm, BHHD was fed up with slow turnaround times, inability to deliver, and boring design. One of their initial website requests was a working online shopping cart. The old marketing firm had spent 3 years on this - and never delivered a working product. Spore Creative was excited to get to work. Harley-Davidson has a well defined brand with a huge international following. Yet, locally, Black Hills Harley-Davidson was strategically placed at the center of the world renowned Sturgis Motorcycle Rally. This national exposure for a local dealership meant getting marketing right was paramount. Spore Creative has integrated social media advertising, email marketing, and traditional promotional outlets such as in-store posters, bag stuffers, radio and television into a multi-faceted long-term marketing plan for BHHD. Now, every piece of marketing that goes to the masses has the individual style and brand of BHHD. And since BHHD has five stores in Western South Dakota - it's important to keep everything unique yet cohesive.